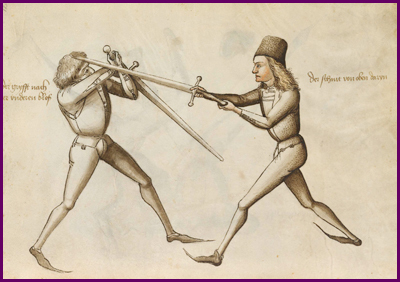 The primary study track of our group is the German medieval tradition Kunst des Fechten ("Art of Fighting"), founded in the 14th C entury by Master Johannes Liechtenauer. There are dozens of surviving manuscripts dating from 1389 to 1607, written by Liechtenauer's many successors and explaining this martial art in detail. The longsword, the choice weapon of the medieval knight, is the teaching tool of Kunst des Fechten and from it the techniques of the other weapons in the tradition are taught. These other weapons, which are part of our curriculum, include sword and buckler; dagger; pollaxe; messer (a type of medieval machete); spear; and hand-to-hand combat. Illustration from one of Hans Talhoffer's manuscripts, dated to 1467. Like any martial art, those who choose to join us in our study of medieval European martial arts will find a source of discipline, character development and good exercise. Additionally, the practitioner will discover the joy that comes from resurrecting history and exploring past cultures. This martial art is about bettering ourselves through emulating the chivalry of the medieval knight and reconnecting to a lost heritage. Historical combat of the European tradition (also known as Western Martial Arts or WMA) has only come into serious, widespread study since the mid-1990's. Prior to that, most people were only familiar with various modern pasttimes such as Olympic style sport fencing, reenactment displays or theater fighting. There are, in fact, many surviving manuals of multiple disciplines from the middle ages and renaissance that are instructional in the combat forms popular in their day. Despite the abundance of such documentation, WMA has only recently begun experiencing a renaissance of it's own, with avid historians and practical-minded fighters alike attempting to re-create the historical combat arts of Europe. We welcome all those interested in reviving this fascinating and chivalric martial art! Join us today!